Adhesive removers are chemicals which soften or disolve adhesives in order to aid their removal. They are usually used within the screen printing industry to clean or reclaim metal frames. 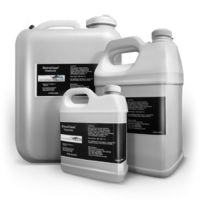 ARP 2000 is specially formulated to remove adhesive from hands, fingers, and other surfaces. It effectively softens the adhesive for removal. ARP 2500 is specially formulated to remove adhesive from the frame after removing the mesh. It effectively softens the adhesive for removal. Liquid softens the adhesive, so reattachment to the frame surface is prohibited. ARP 2600 is specially formulated to remove adhesive from the frame after removing the mesh. It effectively softens the adhesive for removal. Gel suspends the adhesive, so reattachment to the frame surface is prohibited.